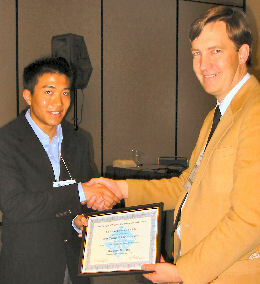 The 2005 Coryell Award winner, Greg Pang from University of California, Berkeley was recognized at the NUCL Business Meeting during the Spring ACS National Meeting. Greg did his undergraduate research project under the direction of Prof. Heino Nitsche and Dr. Christopher Duellmann. He studies the online and offline gas-phase chemistry of the lighter homologues of rutherfordium. The gas phase chemistry of the group 4 elements (Zr, Hf) complexed with fluorinated beta-diketones, specifically hexafluroacetylacetone (hfa) and trifluoroacetylacetone (tfa) was investigated. Two sets of experiments were performed: in the offline regime with macroamounts of stable isotopes, and in the online regime with short-lived isotopes (Zr-85, Hf-158/162/165/169) produced in heavy-ion induced fusion reactions. These experiments were designed as a model study to prepare a future experiment with rutherfordium (Rf, Z = 104). The offline studies comprised thermosublimatography experiments in a temperature gradient tube to investigate the thermochemistry of the Zr/Hf – hfa system. In the online regime, attention was paid to parameters that will be important in an experiment on a one-atom-at-a-time scale (in the case of Rf), namely maximum speed and yield. A maximum yield of ~90% for the 3.24 min. isotope Hf-169 was reached showing that the system is feasible for a Rf experiment. Successful application of this chemical system to a Rutherfordium experiment would result in the first transactinide compound with organic ligands.